« The Cruise … part one. 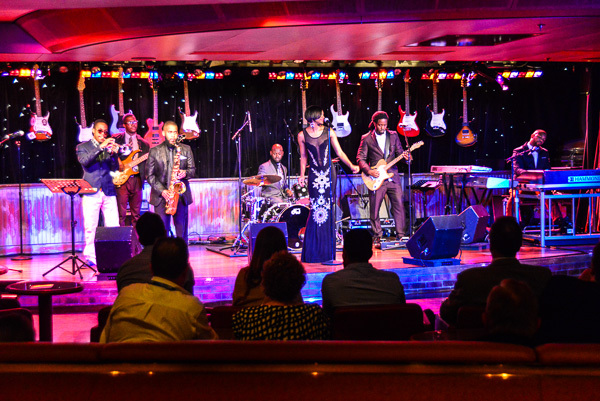 The Cruise … part two. August 18th. 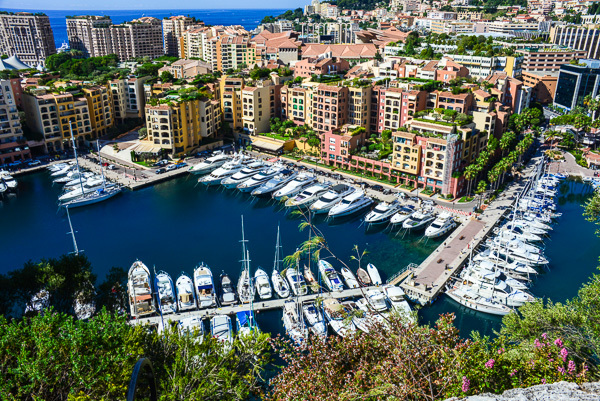 It’s Monday … let’s see …it must be Monaco! 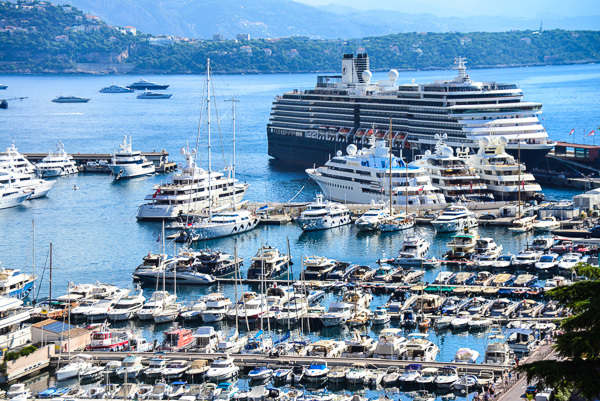 The ship is parked right in the harbour next to all the very flash boats you would expect to find in this port for the very rich. In the midst of this deluge of places to explore, we have discovered our limitations and found that three to four hours walking in any new city along the way seems to suit us best. Luckily, Jacqui’s back is allowing her to walk at the moment (long may it remain so) and today, that allows us to start up the hill to the palace, stroll around the headland and back to the ship stopping only for an amazing cup of hot chocolate in the Chocolatier de Monaco hidden in the maze of streets on the top of the hill. 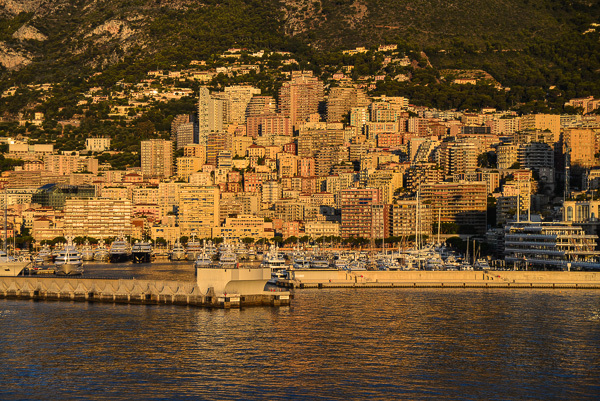 First view of Monaco in the early morning light. Spot the cuckoo in the nest! Everything is just so, with beautiful views along the coast from among the trees in the manicured parkland. The maze of colourful streets next to the palace. The decoration in the church is beautiful. 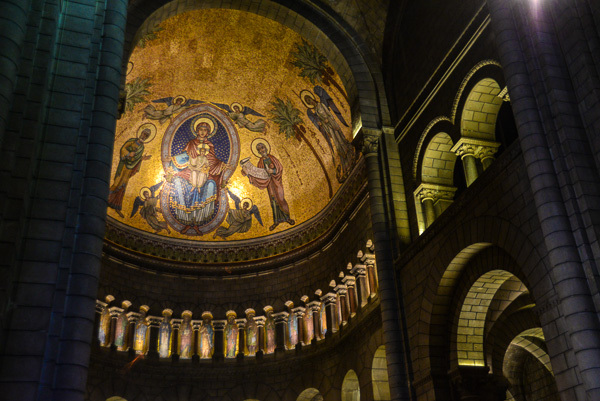 We often take a pew for a while in the churches and gaze in quiet admiration. 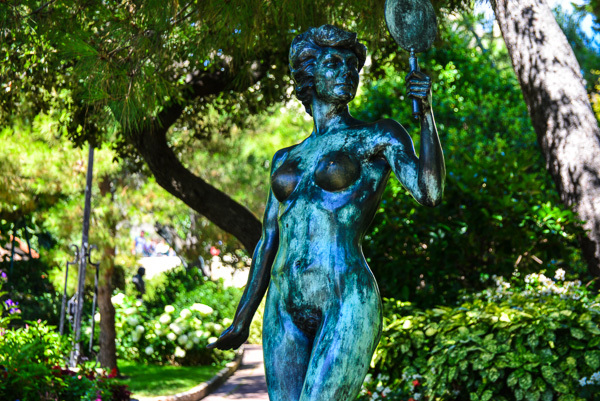 The manicured parkland with it’s many sculptures. It’s those naked women again. It’s now afternoon and Jacqui has gone off to look at the shops. I walk part of the Formula One motor racing circuit and take the obligatory photo of the very famous hairpin bend. Money oozes out of the cobble stones. It’s not often that you see a McLaren parked in the street between two Bentley Convertibles with a Maserati and a Bugatti a couple of cars along! As for the boats … well, nothing very small here. The wood paneling and chrome sparkle in the sunlight while the occupants hide inside. 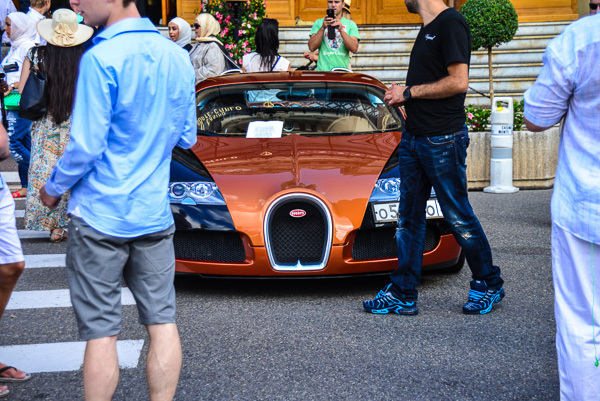 People love to have a pic of themselves with this Bugati in the background. Shiny boats for the very rich line the dock. 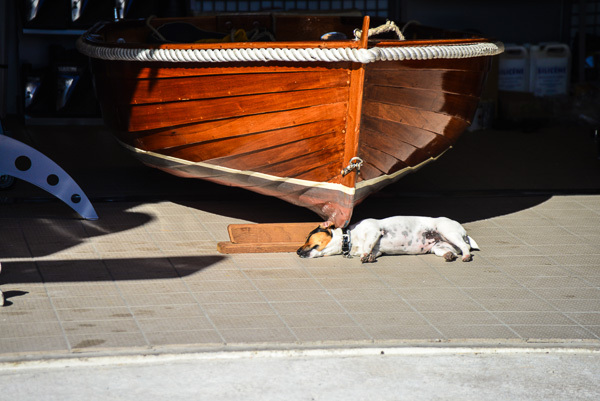 Shiny boat for the rest of us … it’s a dog’s life! Back to life on the ship. For several hours every evening a five piece band plays smooth music in the Ocean Bar; an eight piece band plays Rhythm and Blues in the centre lounge; an extremely popular piano man plays singalong music in the piano bar; a guitarist plays and sings all your favorite songs from the past up in the Crows nest; a pianist and violinist entertain with classics in another small lounge. If you are a night bird, the DJ in the nightclub gets going around eleven until three in the morning. You can meet up with your fellow bridge enthusiasts or drop in on the LGBT gatherings. Take evening Mass at five if you like or play volleyball up in the enclosed nets on deck ten. There are always free computer classes to get to know Windows 8 or how to get the best out of your digital camera. Fancy a cocktail tasting before dinner or a seminar on wine appreciation? They’re yours. How about a fine art auction? Activities for every taste! R&B in the Queens Lounge on most nights. The centre atrium complete with glass staircase. 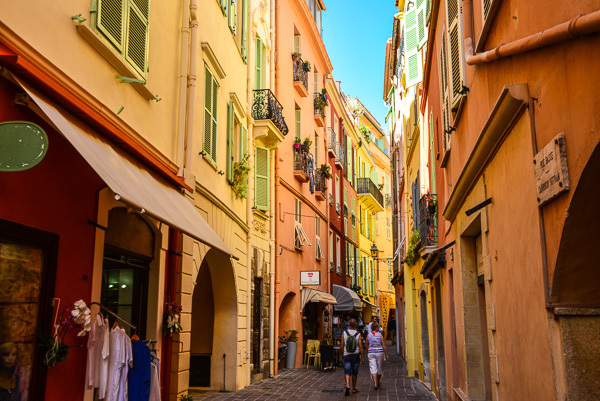 It’s Tuesday … um … that would be Corsica and the small town of Calvi. Here we are transported across the bay to the island on a tender so that we can admire the Citadel dating back to the thirteenth century and the rumoured birthplace of Christopher Columbus. 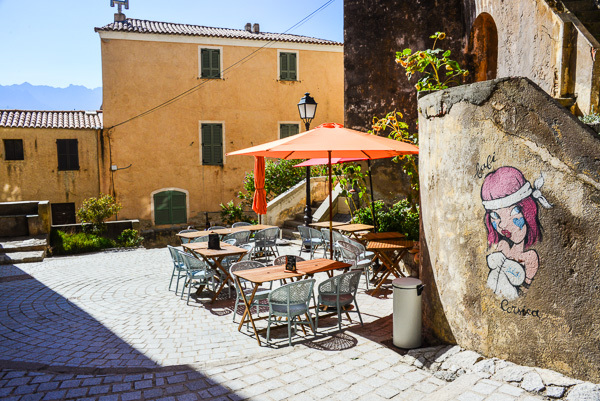 We explore the ramparts of the citadel and admire the statue of Christopher, then wander the narrow streets before settling for refreshment in a small harbour side cafe. This is to be our last stop in France. We have enjoyed France. We did arrive in this country with a few preconceived ideas about the French and most of those have been proved untrue. It may have been that back in the 1960’s on visits to “the Continent”, as we called it, the French may have been more insular, generally unfriendly and certainly extremely reluctant to speak any English. The roads were bad (hence French cars all had very good suspension) and they hooted a lot. It is also possible that our experience in that country when young has become very vague and distorted over the decades since. This time we have found the French friendly and helpful and the English language is widely spoken. And they don’t hoot … even in Paris! We notice that France appears to be more concerned about the ordinary person than is true in the more capitalist focused countries. They haven’t destroyed all the small farmers; on the contrary they have protected them (much to the chagrin of some of the English). Roads are places where pedestrians can still exist; the number of pedestrian crossings is amazing, and they will close off streets to vehicles at the drop of a hat! As for the food … it is still common practice to buy food every day from the markets and the high quality of the food on sale reflects this. Fresh food just picked – yum! Shops still all close for lunch and don’t open much on Le Week-End. 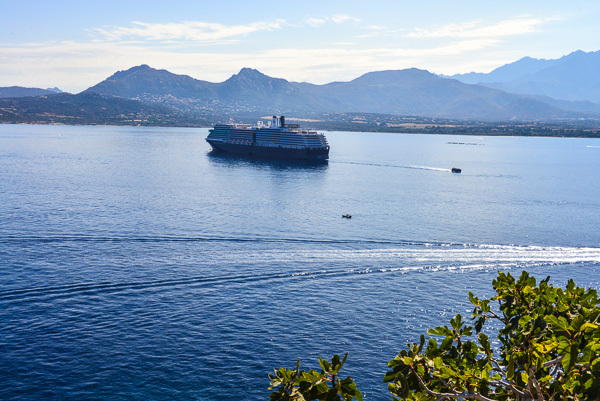 Arriving in Calvi, on the French island of Corsica in the early morning light. 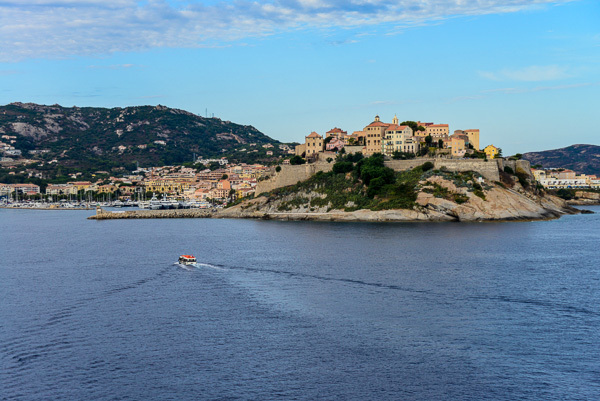 The citadel was built in 1450 and legend has it that Calvi is the birthplace of Christopher Columbus. The tender runs backwads and forwards to the ship all day long. Come and go as you please. This looks like the plum job when the tenders are needed. 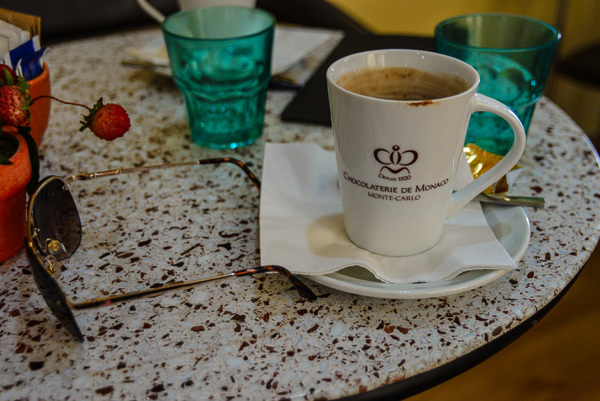 A cafe around every street corner. Here a line of men (including me) await the return of their women from the bowels of the dress shop! 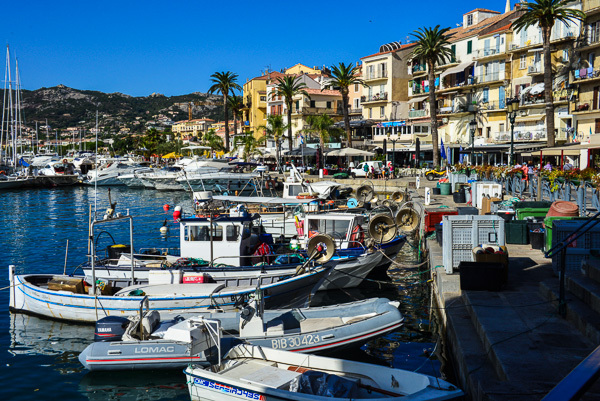 The oh so pretty harbour in Calvi. It’s Wednesday … that would be … ah yes … Livorno … our first Italian city. Those who do such things get on the tour buses and rush off to Florence and Pisa or up to Lucca. We are content to wander the town, known by some as little Venice because of it’s maze of canals through the old city. Of course, it’s nothing like Venice at all. This is our first contact with Italy and we are surprised that it is so different. Our impression is of past glories now considerably run down. The Italians seem to go in for six to eight story blocks with mostly flat roofs … quite different to France and it’s narrow streets and red tiled roofs. Another cruise ship docks on the opposite quay. 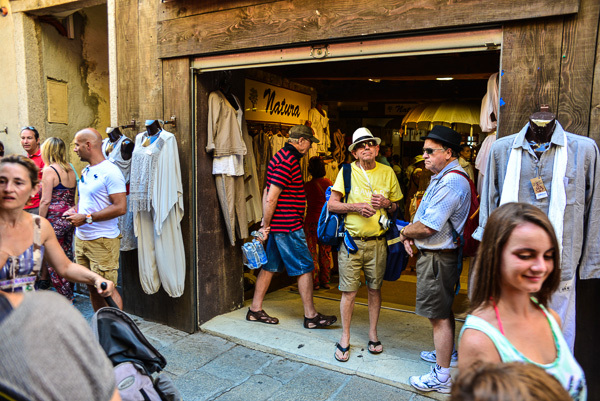 Livorno is the starting point for tours to Florence and Pizza. 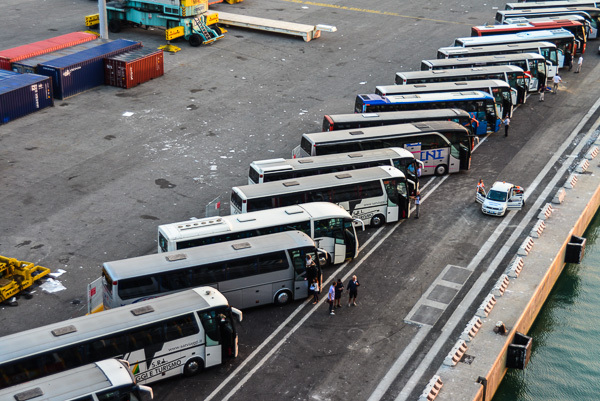 The line of busses on the quayside await their guests. We notice how many rice bowls are filled by the visiting cruises. 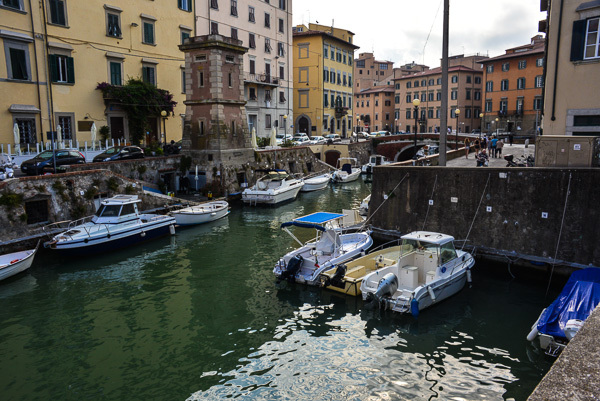 Livorno is sometimes know as Little Venice because of it’s labyrinth of canals. I’d say a very poor cousin. Lots of signs of decay and graffiti everywhere. Another monument to times past. 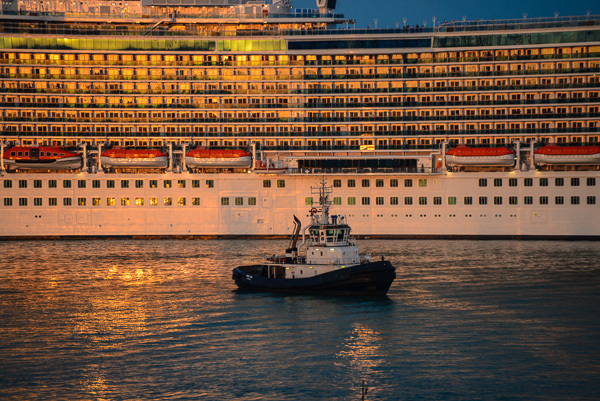 There are a lot of families taking a cruise, and it is easy to see why. Hidden away at the back of deck ten is the children-only section where the 270 young people on board between the ages of three and seventeen can spend their time being looked after by someone else. They also have free access to food, so can go for that ice cream anytime they like. 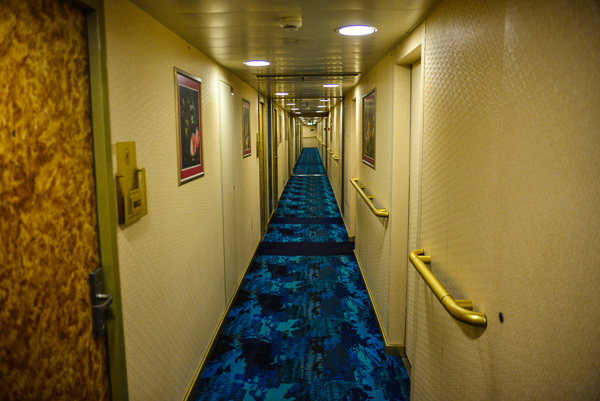 Our corridor on Deck 8 – Navigation Deck. Thursday is a sea day which passes surprisingly quickly now that we are in the routine of shipboard life. It is very comfortable to have everything laid on whenever you want it. 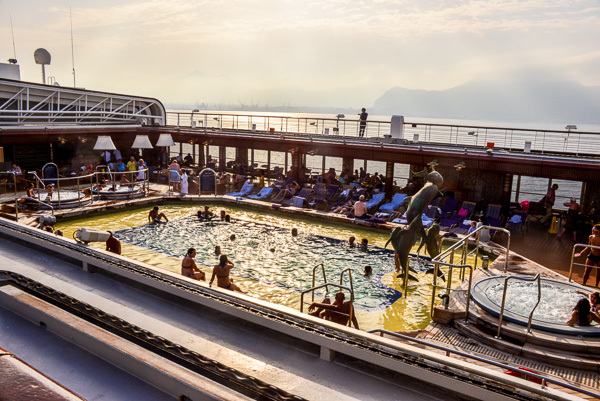 One could get very used to this and it is no surprise to find out the fellow passengers we speak to have often done multiple cruises … one couple from Perth were on their seventh. Our fellow passengers could not be more of a mixture. Every language and nationality that you can imagine, and of all ages are represented. Thirty percent of the crew are from the Philippines and half are from Indonesia. 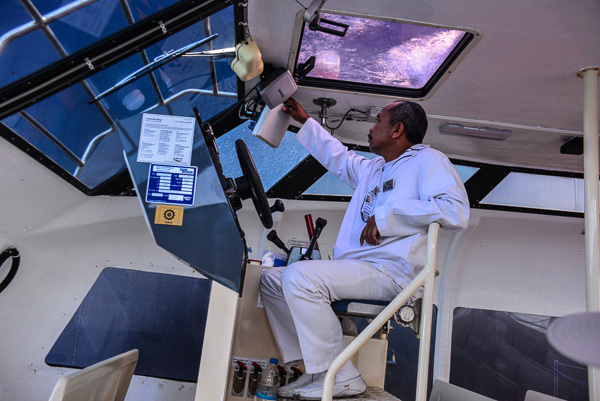 They are a constant friendly, smiling presence all around the ship. The captain and senior officers have a bias towards Holland. 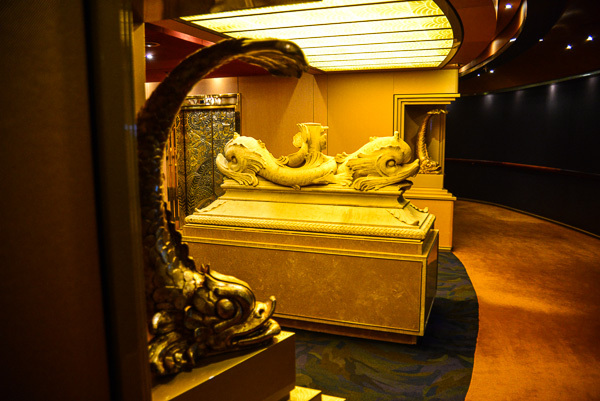 Artworks of various kinds decorate every corridor of the ship. Friday must be Tunisia. We awake to find the ship heading into the sun (I could have sworn that Tunisia lies in a southerly direction) and sometime later find out that we will not be going there after all. No reason was given, except that it wasn’t happening and that we were on our way to Sicily. Later we were told that for “security reasons”, the head office of the company in Seattle had told them to give Tunis a miss. We have another day at sea. 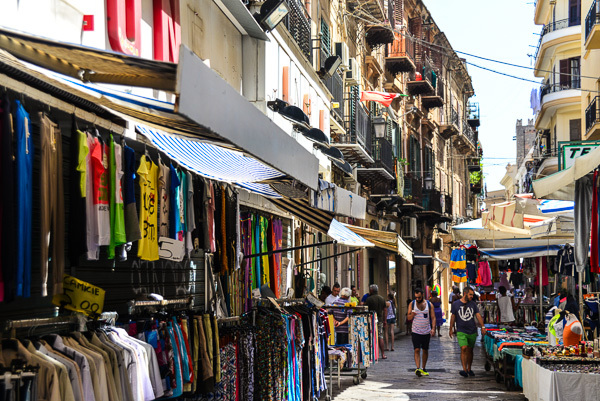 The narrow back streets of Palermo – lots of cheap market stalls. Saturday morning finds us tying up in Palermo in Sicily, a city about which I know nothing at all save that, by reputation, it has had strong association with the Mafia. From the dock we can walk straight into the main part of the town. 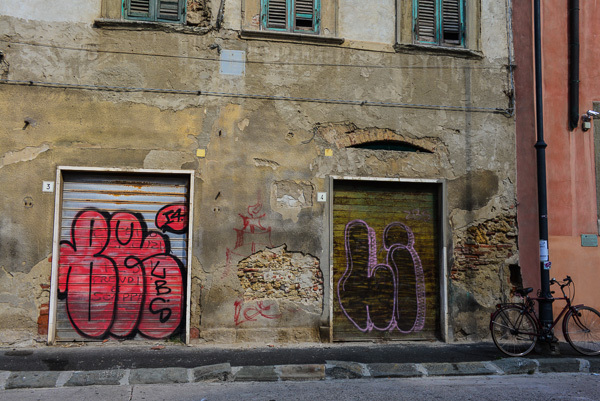 What was it we did in Palermo? The cities blur into one another coming in such quick succession, with the haze of shipboard life in between. 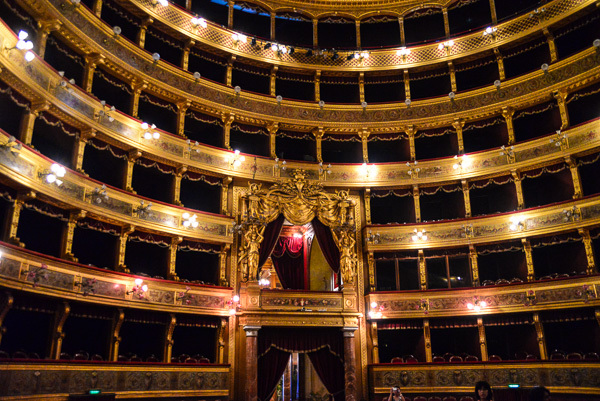 Oh yes .. we visit the Opera House, a magnificent building still in much use today. That things are slowly deteriorating is in evidence, with water stains on the ceilings and plasterwork in need of repair. 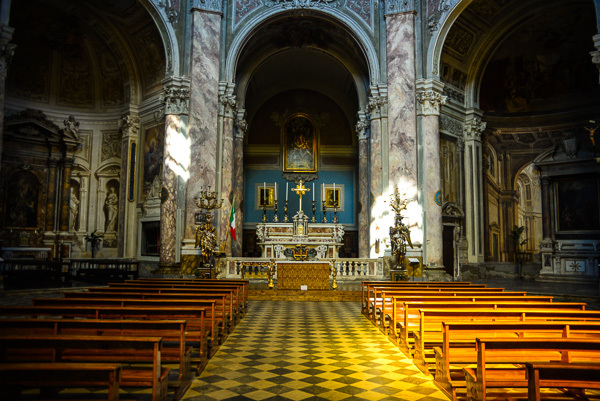 We also visit the church of San Dominico with it’s arched ceilings and intricate carvings. Then it’s back to the boat once more, and before we know it we are waving goodbye to another city. 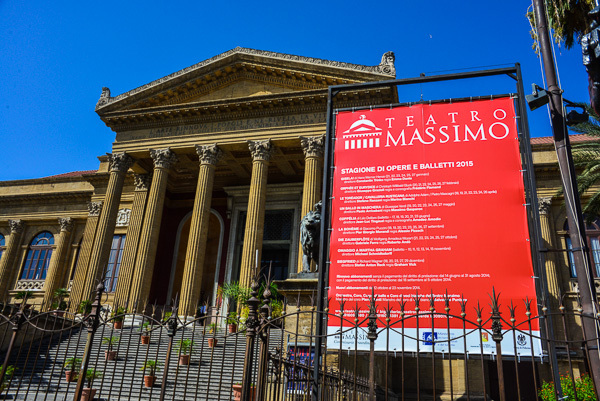 The Teatro Massimo in Palermo. Still very much in regular use, particularly for opera. The balconies in the magnificent Teatro Massimo. 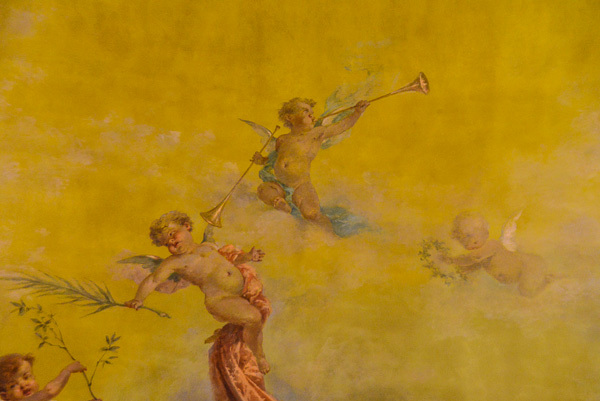 Painted walls in the royal box – peace on this side, war on the opposite wall. Amazingly, you can lean against them. 24th August. We are now sailing into Naples and our cruise is coming to an end. Here we will disembark and continue our journey down to the Amalfi Coast. 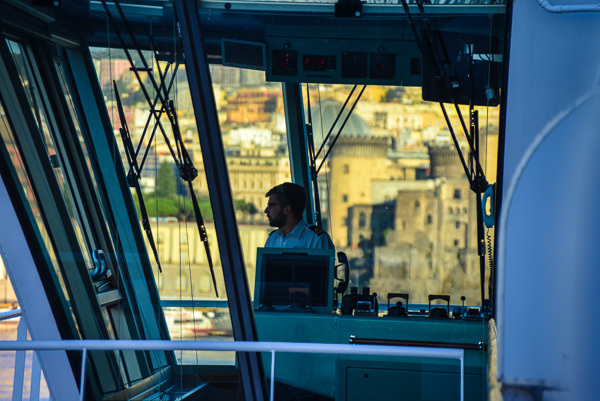 Arriving in Naples … time to get off the boat. This view from our balcony through the flying wing of the ship’s bridge. So what do we think of this cruising thing? 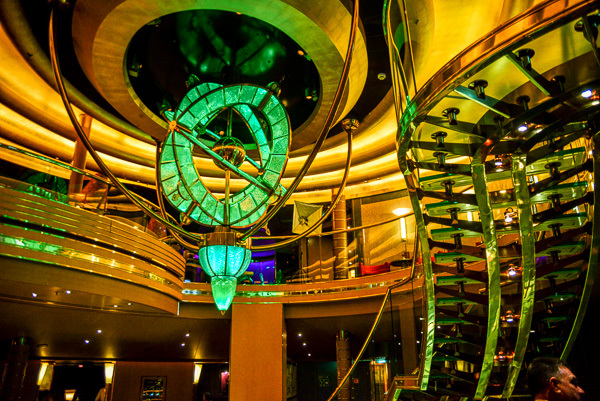 There is no doubt that on this ship anyway, it is very comfortable and the food and facilities are excellent. We felt very well cared for and every whim could be satisfied with little effort. It would be particularly good for anyone who was physically challenged; there were a number of passengers in wheelchairs and some care had been taken to make life easier for them. You need to like ship board life. By my very rough estimate less than 20% of our time was actually spent on shore. However, if we had taken more of the offered tours we could have spent more time off the boat. We found that most tours were too expensive for us to consider (say $200 per person) and the only one we booked, to Cathage in Tunisia, was canceled since we never actually got there. We preferred to take our three to five hour rather random walks around each place we visited. We would find a cafe somewhere along the way and watch each new world go by. However, as Jacqui was quick to point out, the perceived time ashore seemed a lot longer than the hours on the clock because it was all new. On the other hand, the perceived time on board shrank a little because you were doing ordinary things like eating three course meals in a comfortable restaurant, or reading quietly in your room (yay! lots of time to read), or taking a stroll around the promenade deck. We had expected to be rather more regimented, but in fact we are free to do what we like within the obvious constraints. We could share a dinner table or not. We could come and go as many times as we liked on the shore visits. Room service was always an option. The other pool with it’s Jacuzzis, hot dog and hamburger bar and table tennis tables under a closable roof. Our final bill for on-board spending was $350 most of which was for the automatic service charge of $12 per person per day. Initially we weren’t too happy about this, but after a while we were so impressed by the excellent and freely given service from all of the crew we came across, that we were happy to pay it. If you like to drink, have a massage, or shop (or dare I say it, gamble), that figure could go sky high. Everything on board that wasn’t free one bought with one’s “card”, which made it all a bit easy. When I paid up before leaving the women next to me had run up $4,500! Sometimes I felt like I was in Star Trek and had access to the Holodeck. Cities somehow lost their geographical location and became a daytime extension of the boat neatly arranged for our benefit. If we were to consider another cruise at some time in the future, it might be to visit places that are really difficult to access any other way; say up the fiords of Norway and north of the arctic circle or across the pacific to visit all those small islands. The last stretch of our Grand European Tour is upon us. 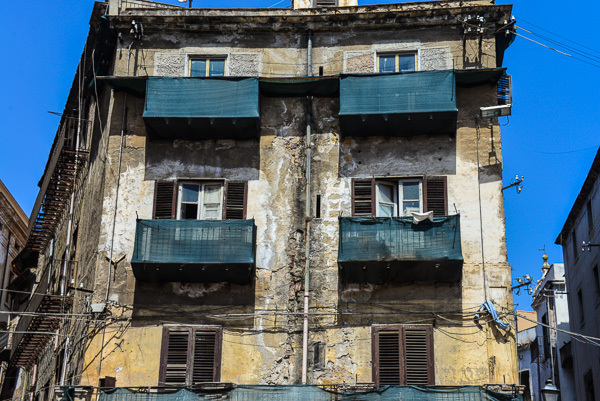 Naples, the Amalfi Coast and finally Rome! 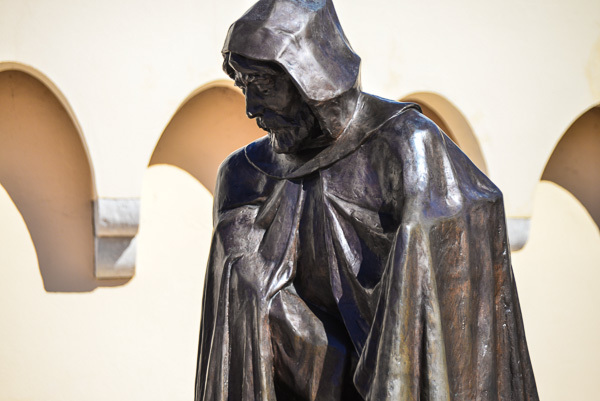 Outside the palace stands Grimaldi, who started the whole Monaco thing off all those years ago by quietly invading the castle disguised as a monk. 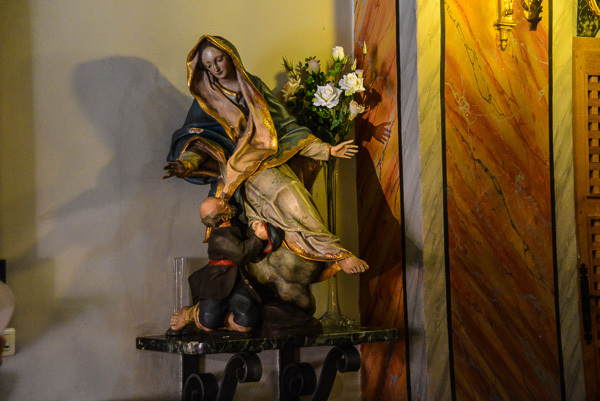 A very ornate figure in the church in Monaco. 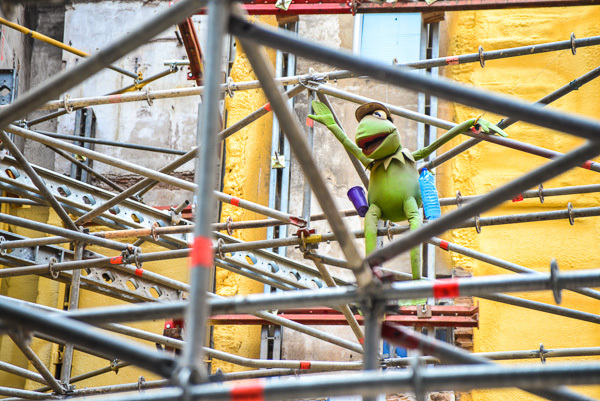 Kermit hanging around on a building site in Barcelona. Loved reading your travel log Alan. We have done the ferry up the fjords in Norway on the Hertigruten and its fantastic, not the luxory of what you have been on but we found it extremely comfortable and spectacular. Well worth doing. I have forwarded a couple of your emails on to Billie as she was asking after you, trust that is okay with you. We enjoyed our travels to UK, Iceland, Alaska and Hawaii. 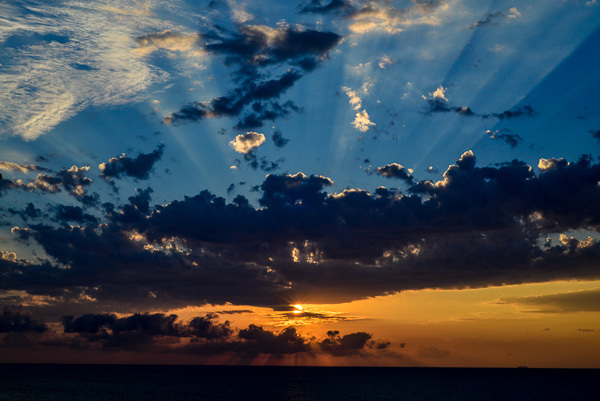 Have been following your progress and enjoying your voyage vicariously. 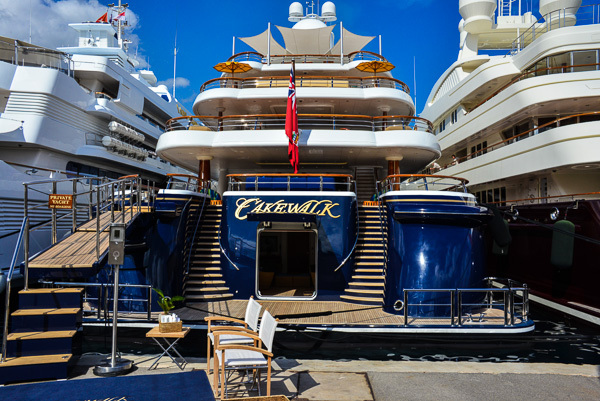 I have had a Med cruise on my list of things to do, but more the small yacht variety around Greece and Turkey – ah but I haven’t actually done it! 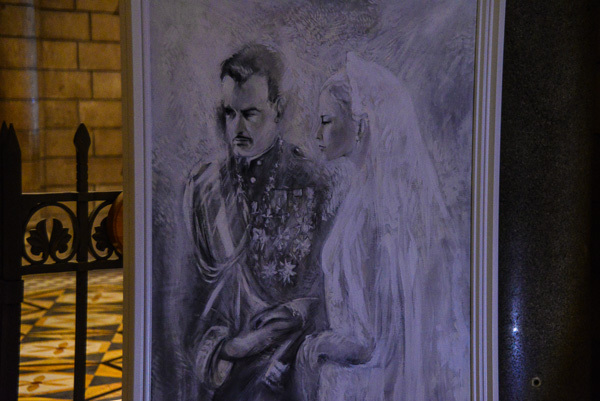 My sister-in-law danced at Princess Grace/Ranier’s wedding a long time ago with the Saddler Wells ballet company, but she still remembers it. Hope to catch up over phone on your return, meanwhile am enjoying great pics and diary. Thanks Alan. Just read pt1and2. Always wondered who went on those cruises and what they were like and now I know. Fabulous pics – really enjoyed! Again…fabulous thanks. 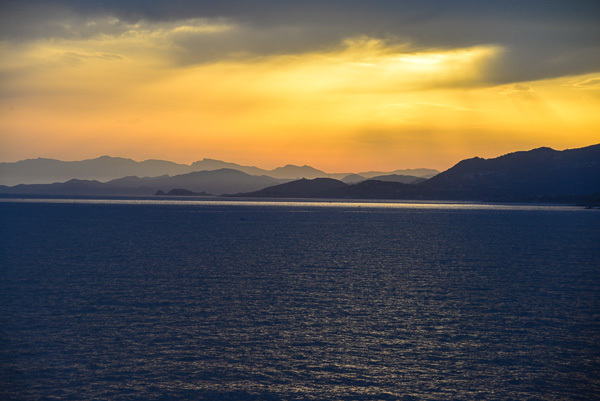 And really liked the ‘arriving Calvi’ photo, with all its 3d effects! . Enjoy the rest of travels, travel safe. Look forward to the final foto’s! And when home? Bill with us at present…great. Cheers, love, C&R!